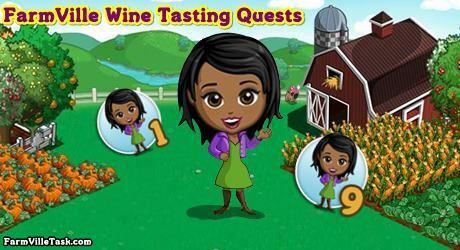 Join our friend as she is inviting us to come along with her in FarmVille Wine Tasting Quests. She is exciting with the upcoming event that is why she wanted us to come along with her as we taste some of the best wine in the city. We will plan our trip in this mission. On this FarmVille Quests, We are going to craft 9 recipes at the BAKERY, SPA and WINERY. Prepare ahead with the bushels that we are going to use by collecting them early. Note: Expected to be released on Thursday (March 28). Info: Crafted at the BAKERY and will need Taro Bushels x8, Wheat Bushels x6 and Rye Bushels x4. Info: Crafted at the SPA and will need Lily Bushels x2, Blueberry Bushels x6, Morning Glory Bushels x6. You only need 6x Blueberry Bushels (not 60! ).